Empirically based curricula for infants and toddlers are required for many accountability systems. But what does “empirically based” mean? What does it look like? And how can educators assess whether this type of curriculum is being used effectively? This brief aims to provide background and guidance to policymakers and practitioners in the context of this emphasis on curricula for programs serving infants and toddlers. 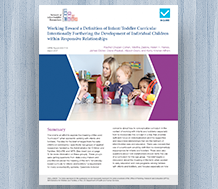 Visit the Working Toward a Definition of Infant/Toddler Curricula: Intentionally Furthering the Development of Individual Children within Responsive Relationships resource page to learn more and download your copy.